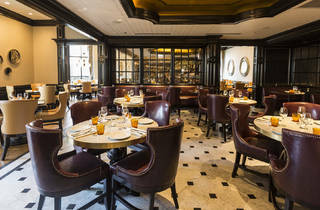 Michael Mina's showy brasserie turns out occasion-worthy French fare and impeccable service in a lavish space that suits its Waldorf Astoria location. 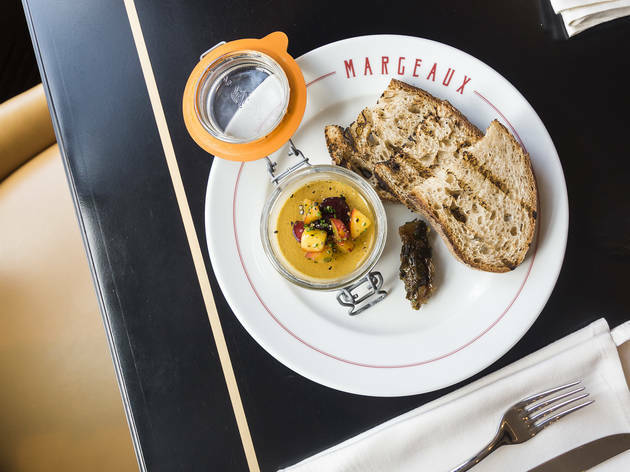 It’s been a big year for Chicago’s dining ego. 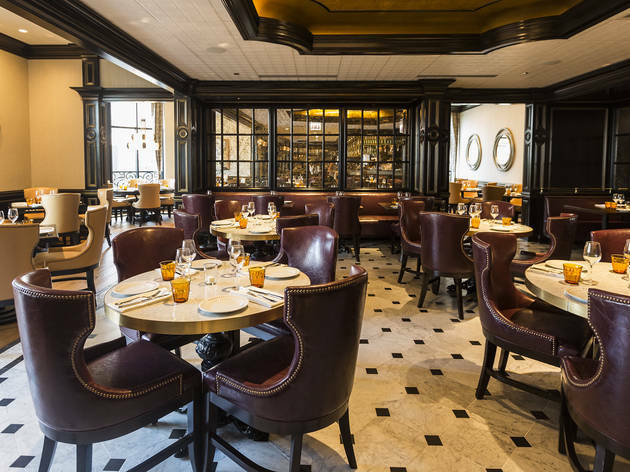 First Conde Nast Traveler named us America’s top dining destination; then Bon Appetit dubbed us Restaurant City of the Year. While I work through these childish feelings, I’m happy to report that Mina’s Midwestern debut brings as much substance as style to the third floor of the palatial Waldorf Astoria. 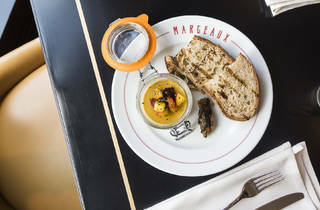 Sure, Margeaux Brasserie may not live in the realm of bootstrapping envelope-pushers and ethnic owner-operated spots that have made us singularly, perfectly Chicagoan in the eyes of the national press, but its celebratory menu and world-class service guarantee you a damn special—albeit pricey—experience. 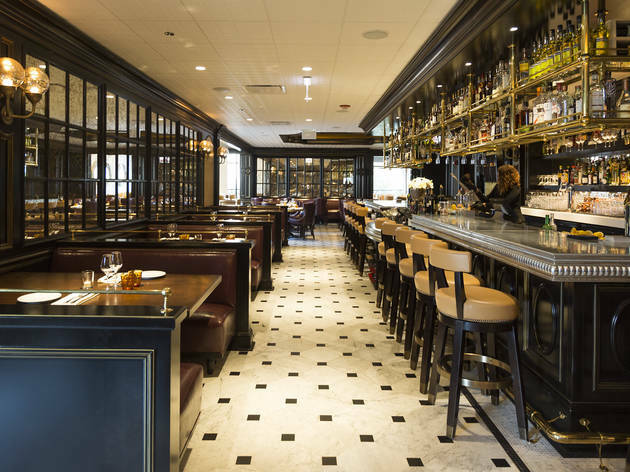 Through the Margeaux-dedicated entrance and up the Margeaux-specific elevator, the marble tile threshold inlaid with the restaurant’s name in gold was a fittingly showy welcome into this sultry boite, which is broken into three dining areas. 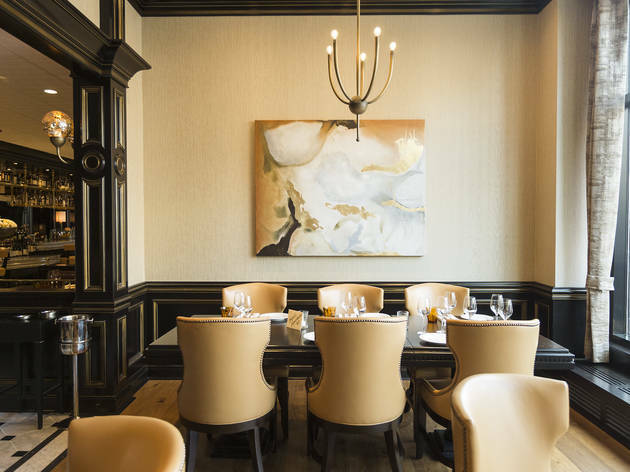 While I waited for my date (a persnickety fellow writer) I ventured over to the side dining area, where four-top tables with blonde-leather winged chairs are scattered across an expansive oak-plank floor, with views overlooking Walton and Rush Streets. I made a mental note to next time request the cozy corner nook with curved, hunter-green banquette. I returned to find an affable manager pouring me a splash of Chartogne Taillet brut champagne he’d pulled from the roving champagne cart. “You don’t have a real drink yet,” he insisted. Pale golden bubbles and tart apple notes danced pleasantly on my tongue as I perused the Hemingway-esque cocktail menu. 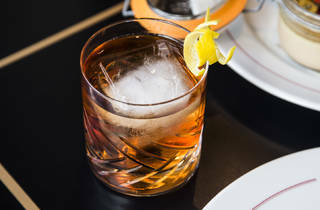 I ordered the Green Hills of Africa, a frothy, rummy sipper perfumed with jasmine, bittersweet cocchi americano and a hint of matcha—served over crushed ice. 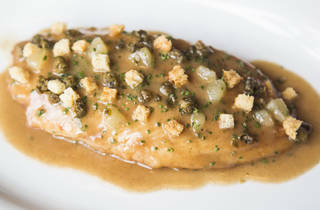 Then came executive chef Brent Balika’s parade of vintage Paris’ greatest hits. Tender mussels and bacon lardons bathed in buttery, vermouth-scented broth, alongside a slender tin overflowing with crisp fries—enough for (and priced like) an entree. 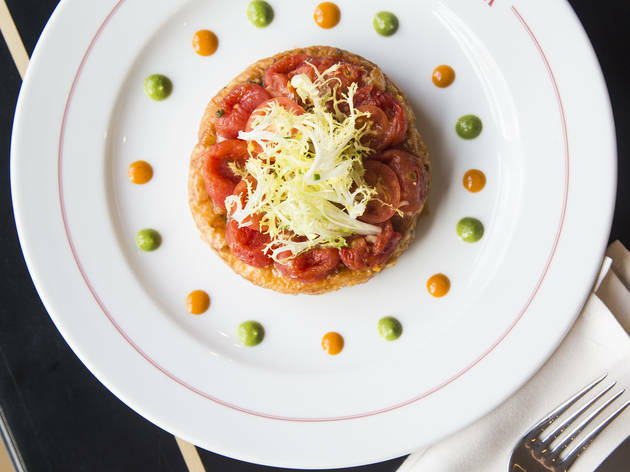 A simple tomato tatin—juicy, garlicky, just-poached tomatoes arranged atop Dijon-smeared puff pastry with Camembert—was sunny Provence incarnate, preciously encircled with dots of smoked tomato vinaigrette and basil pistou. I hope our hydroponic advancements in year-round, not-sad tomatoes mean this beauty can stay on well past Midwest mater season. 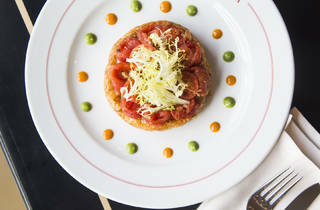 You’d be remiss not to pair your quintessentially French meal with a wine from Ryan Baldwin’s elegant, food-loving list. Minerally, salty Domaine de la Pépiere Clisson muscadet begged for briny raw oysters, while dry, intense Pascal Clement chardonnay cut through oozy camembert and pastry, while still offering enough body to stand up to grilled steak. 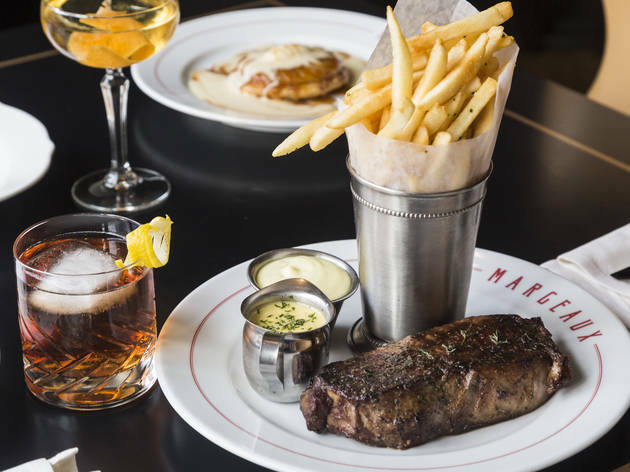 On that note, we couldn’t resist the New York strip steak and frites, served with little cups of herby bearnaise and lemon aioli. You can opt instead for filet or ribeye with all kinds of sauce embellishments, but why, when the carnally toothy strip—mid-rare to its charred edges—was made for this kind of gloriously unfettered bistro fare? 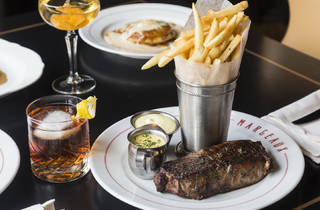 “These fries were definitely cooked in meat fat,” Man-date announced, dunking one in aioli. I agreed, shocked to learn later that they’re actually fried in canola oil then tossed in herb-infused duck fat. 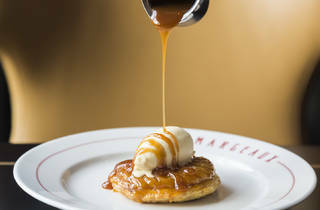 Even if you indulge as much as we did, promise me you won’t skip pastry chef Ashley Torto’s stunning desserts. 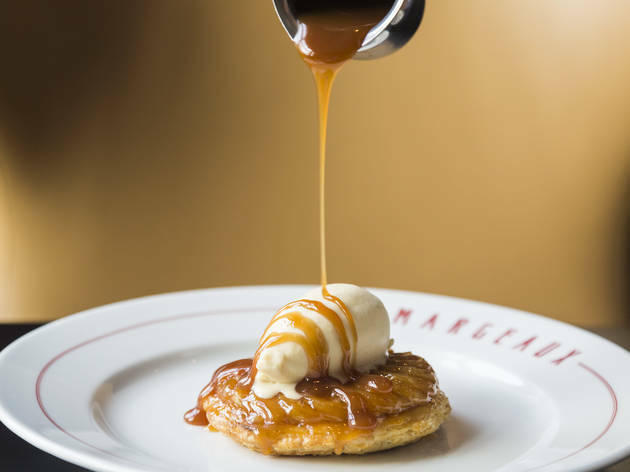 I gasped audibly as a server cascaded citrus-scented caramel over our lacquered banana tart tatin, creating tiny golden rivers that mingled with the melting honey ice cream on top. He seemed to enjoy our reaction as much as we relished diving into that dripping puck of caramelized bananas and buttery pastry. 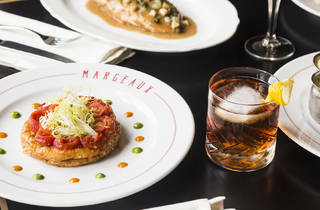 If I only could’ve afforded to, I’d have booked a night at the Waldorf and padded downstairs the next morning for a ratatouille tartine and a cafe au lait on Petit Margeaux’s secluded, European-esque patio. 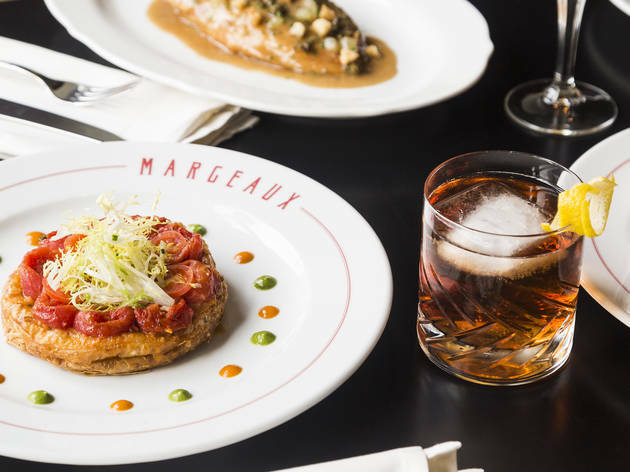 Alas, our sparkly Parisian jaunt ended that night with me easing into a Lyft holding a Margeaux-branded doggy bag, wishing more Mondays could feel so celebratory. 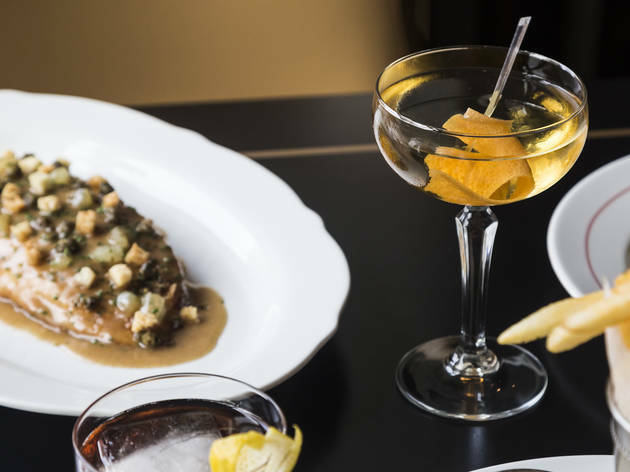 Atmosphere: 1920s Paris is the decor and food muse at this chic, pricey restaurant, with impeccable service and a refreshing, seasonal takes on classic brasserie dishes. 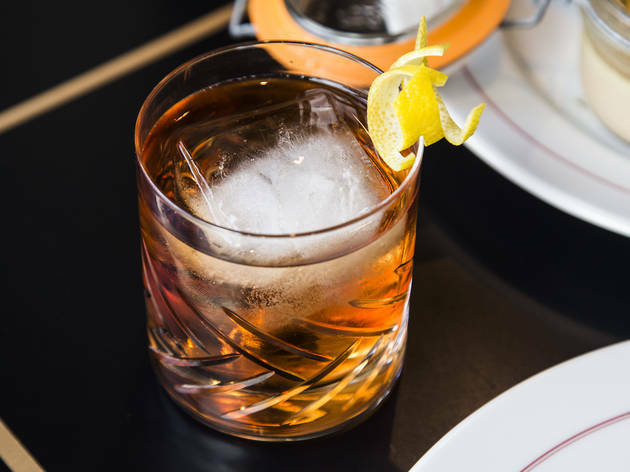 What to drink: Boozy throwback cocktails like Les Vieux Corps, a cognac and cocci americano-inflected take on NoLa’s Vieux Carre, plus ask for pairing suggestions from the French-leaning wine bible, which is full of rare finds. 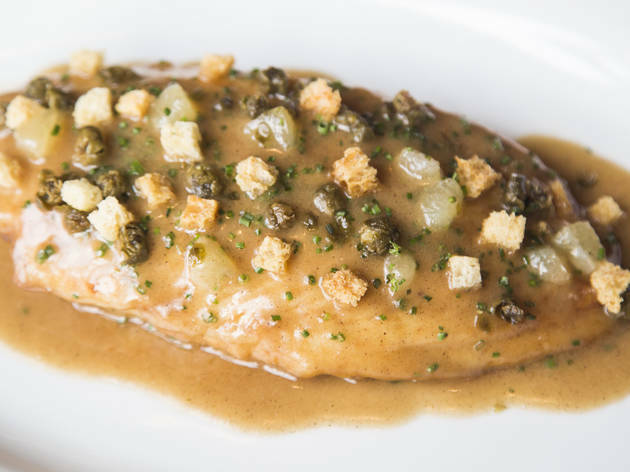 What to eat: You can’t go wrong with the highlight reel of decadent French dishes, from mussels to foie gras, New York strip steak frites and elegant Dover sole. Don’t skip dessert, particularly the banana tart tatin and the giant Valrhona chocolate macaron with milk chocolate cremeux and fresh berries. Where to sit: There isn’t a bad seat in this sultry, three-part space. 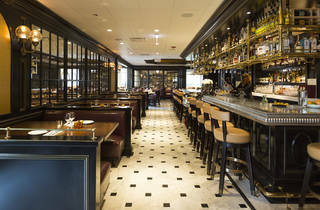 The dark, carpeted lounge with diamond-patterned plush seats is ideal for an aperitif. 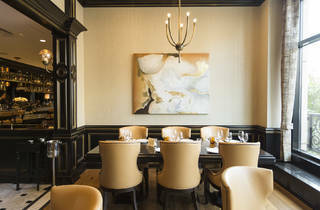 Try to snag the tufted green corner booth in the side dining room for an intimate date night. OK, I am obsessed. LOVE this place. I went for dinner with a friend, and immediately came back for happy hour the next day, lol. As expected, the service is spectacular. 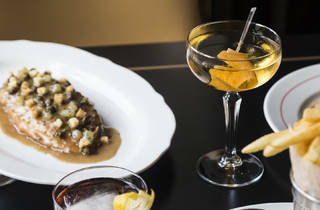 Despite showing up in my usual jeans and sweatshirt garb, I was treated like royalty -- given a free aperitif or amuse-bouche on both occasions. The food is glorious. If you're balling on a budget, I highly recommend the happy hour, where you can nosh on duck wings a l'orange and drink hemingway daiquiris for less than $15. I will be back to try the steak on one of my upcoming pay days, haha. Worth it!